Home Supplier Directory Vaughan Company Inc.
Get Vaughan Company Inc. quotes! Fields are incomplete or inaccurate information. Please correct below. Just fill out this short form and we will connect you with an Vaughan Company Inc. associate to quote you the right pump for your job. Vaughan has manufactured leading chopper pump technology and related equipment since 1960. The company offers a full line of chopper pumps and centrifugal screw pumps for the industrial process, municipal, and agricultural applications. The pumps are available in a variety of construction material options, including hardened steel, high chrome iron, ductile iron, 316 stainless steel, and CD4MCu hardened stainless steel. The pumps have flow capacities from 50 to 14,000 gpm. Vaughn manufacturers its E-Series submersible chopper pumps for the deep sump applications. The pumps have flow capacity from 50 to 14,000 gpm and total head limits to 250 feet. The E-Series is designed to allow for external adjustment and maintenance of all cutter clearances. The submersible chopper pumps are also available with an explosion proof motor and tandem mechanical seals. 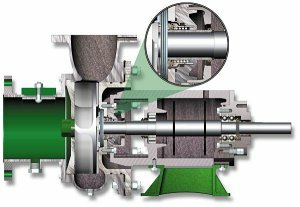 The company produces a cantilever centrifugal pump designed for pulp and paper recycling, mining, fish waste, storm drains, and mill scale. The pump features a special design to accommodate waste sumps with high solids, abrasives, or corrosive material. The cantilever pump is available in 3 inch through 6 inch discharge sizes. Vaughan makes a vertical dry pit centrifugal chopper pump with flow ranges from 50 to 7,000 gpm and heads up to 280 feet. The pump is available in 3 inch though 12 inch discharge sizes. The vertical dry pit pump is also available in both horizontal or pedestal configuration depending on the application. The pedestal configuration is often used in dry well applications where floor space is limited. The company produces its PRIME-Cut self-priming centrifugal chopper pump. The pump is a new product for the company and has the ability to prime up to 20 feet. The PRIME-Cut pump is available in direct and belt drive options, has discharges sizes from 4 inch through 10 inch, and includes a heavy duty cartridge design. Vaughan manufactures and sells a horizontal end suction centrifugal chopper pump with flow rates from 50 to 7,000 gpm and total head limits to 280 feet. The pump is available in 3 inch through 12 inch discharge sizes and is available in each packing or mechanical seals. The company’s recirculating centrifugal chopper pump are built for sludge pits, wood and bark pits, scum pits, and other pits where heavy solids collect. The pumps are available in 3 inch through 6 inch discharge sizes and either vertical wet well or submersible configurations. The pump features ductile iron valve assembly, nozzle assembly adjustable horizontally and vertically, and reach rods located above the pit level. Vaughan’s vertical wet well chopper pump is built for mining, steel, food processing, chemical, wood product, and municipal applications that involve severe pumping challenges. The pump is available in lengths up to 25 feet and features ductile cast iron casing and bearing housing. One of Vaughan’s most recent pump designs is its Triton® screw centrifugal pumps. The pump’s open channel impeller design is ideal for handling large solids, thick sludges, and abrasive materials. The pump is built to be highly efficient for energy savings and has a low NPSH, which minimizes the suction requirements. Unique features include steep performance curves, non-overloading power characteristics, heavy-duty power frames, flushless mechanical seal design to eliminate water flush requirements, and an optional standard power frame with water flushed mechanical seal or packing. All Triton Screw Centrifugal pumps in Horizontal or Vertical Pedestal configurations are available with the Vaughan flushless mechanical seal. In 1960 Jim Vaughan founded Vaughan Inc. as a solution to pumping dairy manure, which was susceptible to frequent clogging caused by bedding and bailing twine. Today, his invention, the Chopper Pump®, has over 30 patents and is known worldwide in all industries as the pump of choice for reliability in heavy solids pumping. Vaughan continues to lead the industry in chopper pump design, including floating pumps, lagoon pumpers, auger choppers, vortex choppers and veggie choppers. In 2001, Vaughan introduced the Triton™ screw centrifugal pump, combining the benefits of Vaughan's superior pump designs with the advantages of highly efficient, non-clogging performance. 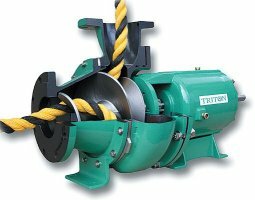 The Triton screw centrifugal pump is ideal for handling thick sludges, large or stringy solids, shear sensitive fluids, and delicate or highly abrasive materials.